Quick Cliq is an application launcher and productivity tool that provides quick access folders, files, programs, links and command-line operations as well as window management, clipboard manipulation and text "memos". 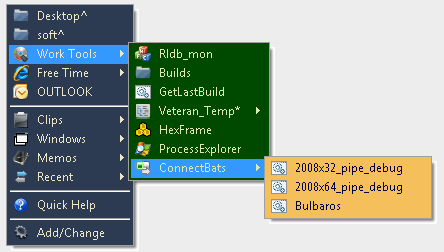 The compact menu can be displayed anywhere via keyboard shortcut or mouse gesture, even within applications. A video preview is available. How to extract: Download the ZIP package and extract to a folder of your choice. Launch Quick Cliq.exe. Fixed many Windows 10 compatibility issues. Snapshoter is a small productivity tool that includes image and video capture program, clipboard manager, image composer, and a post-it note functions. 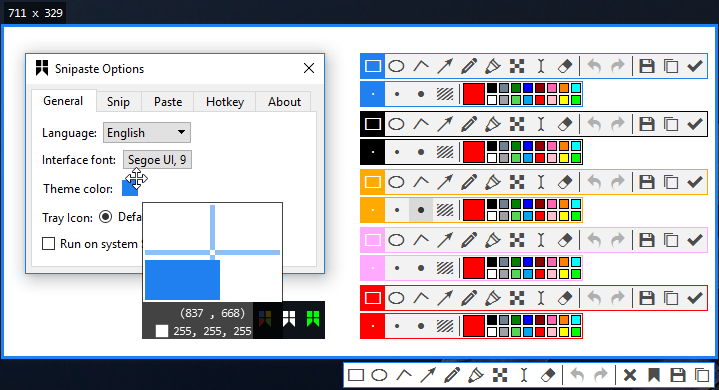 The program can also make image edits with layers, scale, rotate, borders, contrast, add transparency, and use text or arrows. The program can add watermarks or create collages. Supports skins, Dropbox, and saves to JPG, PNG, BMP, GIF or ILBM image formats. Cross-platform with support for Mac, AmigaO/AROS, and MorphOS. Note: Tooltips are visible at the bottom of the window when hovering over an item in the interface. How to extract: Download the RAR package and extract (using a program like PeaExtractor) to a folder of your choice. Launch snapshoter.exe. Really glad I tried this, usually I use fascapture, but this has some great features over it. Like others have said an ability to be able to save captures as pdf would be nice, but hardly essential. There are other programs on here to convert images to pdf. Can't find what you are looking for? This list shows entries with Productivity - Clipboard Tools as a supplementary function. You can view more entries with Productivity - Clipboard Tools as a primary function.